How to unlock Samsung S5620 by code ? Unlocking Samsung S5620 by code is the easiest and fastest way to make your device network free. It doesn't interfere in your system or change it in any way so even after using our code, you don't loose your warranty. In order to receive a network unlock code for your Samsung S5620 you need to provide IMEI number (15 digits unique number). It can be found by dialing *#06# as a phone number, as well as by checking in the phone settings of your device. Depending on the information you have about your S5620. You can use a service based on the country or continent from which it comes from. For your Samsung S5620 you can use the following services: Europe, USA, Canada, South America, United Kingdom, Ireland and many more. All new Samsung S5620 coming from T-Mobile USA or Metro Pcs USA with "Device Unlock App" can be unlocked by a Device Unlock App service. For unlock Samsung S5620 following options are available. If you don't know which option use for unlock your phone, please contact us. We will help you choose the right product for your phone. excellent site, very fast and efficasse, I recommend it without hesitation and I order from you again thank you again. Unlocking instruction for Samsung S5620 ? Entering the unlock code in a Samsung S5620 is very simple. 3. Samsung S5620 is now network unlocked !!! NCK, MCK or SPCK for Samsung S5620 ? In order to unlock Samsung S5620 network blockade, you need a NCK (network) code. If the code counter is blocked, you will need MCK (unfreeze) code as well to reset the code counter. If Samsung S5620 has a blockade for a subnetwork like Tesco or Virgin you need to use a SPCK (service provider) code. What is a Samsung S5620 network lock? 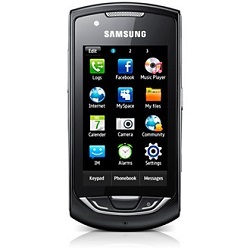 It means that the Samsung S5620 can only receive signal from one network. If you insert a simcard from a different network, the device will ask for an unlock code, or will show the message that this simcard doesn't work. Phone freeze is a result of the incorrect code being inputted too many times, which means your Samsung S5620 is Hardlocked. You will require a Defreeze (MCK) code and a NCK code to unlock your phone. There are different types of unlock codes for your Samsung S5620. One of them is called unfreeze code, which is used to reset the code counter in your device. Samsung S5620 usually have 3 TRIES to enter the unlock code. The biggest problem is that the phone doesn't show the code counter and there is no way to check. If you want to unlock a Samsung S5620 with a blocked code counter, you need the unfreeze code. The code can also be used to remove a regional blokade if you want to travel to different countries. Ca³a operacja trwa³a 15 minut i telefon odblokowany. Cena te¿ jest przystêpna, tak¿e dziêkujê i polecam. Excelente. Ya lo pude desbloquear. Bardzo polecam. Jestem zadowolona, na kod czeka³am tylko parê godzin. Tak¿e szybko i wygodnie. Wszystko ok. Kody otrzyma³em po 20 minutach. Polecam. s³abo wytlumaczone jak zdjac sim locka bo ja zadnym z tych opisanych sposobów nie mog³em tego zrobic, no ale kody by³y dobre. gracias por el servicio es excelente y muy practico ,sin ningun rollo . Bardzo szybko i sprawnie simlock zostal zdjety, bardzo polecam te stronke . Jestem zadowolony. Kod otrzyma³em w ci±gu kilkunastu minut. Po drodze pojawi³y sie problemy, ale z mojej winy. Dziêki szybkiej i kompetentnej pomocy ze strony serwisu uda³o siê telefon odblokowaæ, za co uprzejmie dziêkujê:) Cena mog³aby byæ ni¿sza, ale pewnie jest taka nie bez powodu. El proceso de liberar el samsung S5620 rápido y perfecto. Muy agradecido por su eficacia. Szybciutko,sprawnie i bez problemów.Super us³uga wykonana- gor±co polecam.Firma pewniak. Fantastic Service. I only wait 10 minutes for the code. And then it was so easy. Congratulations If you want to unlock your phone this is the place. I will recommend to all my friends. Pe³ny profesjonalizm, szybko¶æ us³ugi na najwy¿szym poziomie nawet w ¶wiêta. Dziêkujê i Pozdrawiam. Very very fast service, sent codes in under 5 mins and had phone unlocked inside another 2. Five star service.